What’s the Deal with Curved Treadmills? Whether you are new to treadmills or a seasoned professional, you may have noticed a new kid on the block – the curved treadmill! 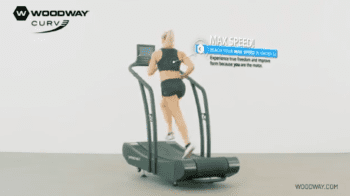 Companies like Woodway, TrueForm and Technogym SkillMill, have introduced curved treadmills to the market for a unique new way to get in a running workout. Since many are unsure what to make of this new machine type, we’ve put together a list of some differences you can expect to encounter. This way you can make an informed decision about whether or not it’s for you. 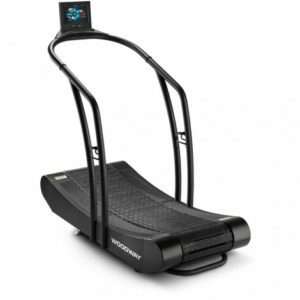 One of the first things you will notice about a curved treadmill is that there is no motor. How can a treadmill work without a motor? Simply put, you are the motor. Curved treadmills use the incline at the front of the belt combined with the friction of your footfalls to generate the belt’s movement. You are the only source of power it needs. You may notice that your run is quieter without the noise of a motor whirling away as you log your miles. While this may seem like an initial advantage, you should also keep in mind that you will have to work harder to keep the machine moving along. No matter the length of time or distance that you run, you will find that running on a curved treadmill is going to be more difficult. A study published in the Journal of Science and Medicine in Sports showed that curved treadmills definitely make you work harder during your workout. The group of researchers at the University of Essex School of Rehabilitation and Exercise Science studied a group of 13 male runners, each with a 5K time of 20 minutes or less. They recorded each runner’s max heart rate, speed and oxygen uptake on a traditional treadmill. They were then allowed to get comfortable running on the curved treadmill. To test the difference, each participant ran five separate four minute intervals at different speeds on both a traditional and a curved treadmill. The results showed that runners work about 30% harder on the curved treadmills. Although you may be working harder, the only thing pushing you is you. You aren’t having to try and keep up with the set speed of the belt, you can simply slow your pace if you need to. On the flip side – you’ll need to be more aware of your running pace in order to keep up your speed. If you become distracted, it may be easier to slow down without realizing you are lagging behind. 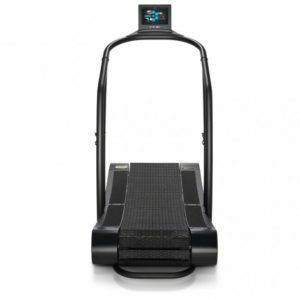 If you are used to exercising on a standard treadmill, you are probably used to taking advantage of all of the interactive features they provide. This is another difference you will notice with a curved treadmill. 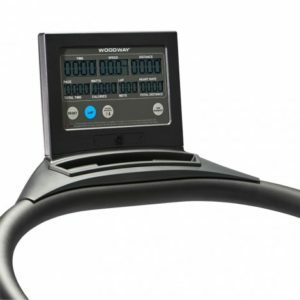 Woodway Curve: With this brand, you will have a display that tracks your distance, time, speed, heart rate and calories burned. You also have the option of saving and exporting reports of your results as Excel spreadsheets or pdfs. TrueForm: These treadmills are made simply to get you running. You have the option to add a display that tracks speed, time, distance and calories burned. However, this does not come standard on any of the TrueForm models. It’s just you and the treadmill. Brands like NordicTrack and Sole pride themselves on providing a roomy running surface, but this isn’t the case with curved brands. The treadbelt size is a very important thing to think about when buying a new machine. Instead, the curved treadmills we’ve seen have much narrower and shorter running surfaces. The front curved part of the belt helps generate your motion with every footfall, so a shorter belt forces you to run up towards the front. Still, this may be a bit of an issue for very tall users or those with long strides. You may feel cramped for space. You can also expect to find a tread belt width of between 17 and 19 inches, depending on the brand. This may feel quite narrow if you are used to something like the NordicTrack x22i Incline Trainer or Sole F85 that has a roomy 22” wide belt. The price tag is going to be another place that you’ll see a difference between the curved and standard treadmill models. Standard models give you a wide variety of machines priced between $600 and $2,999, due to the many choices you have surrounding construction, motor type and features. This article helps you decide how much to pay for your new treadmill. However, curved treadmills rely essentially on their construction and fitness benefits to determine their price. To give you an idea, a TrueForm treadmill will cost you around $6,000 and a Technogym SkillMill could see you spending $10,000! Woodway gives you a little more wiggle-room on price with a range of $4,995-$10,500 depending on the model you want. One last thing to take into consideration when deciding on a standard vs. a curved treadmill is what you are hoping to gain from it. If you can find a curved treadmill to try, you may enjoy the self-powered curvy experience. We admit that they would be really great to work your glutes, hamstrings and calves. They would also work well if you like to do sprints and HIIT workouts because you are forced to really drive through your stride to generate that speed. Remember that the price tag may be a very real consideration. However, for most of our users, we still recommend the traditional treadmills from top brands like NordicTrack, Sole, ProForm, Bowflex, or Horizon. If you are a very tall user or you enjoy using the incline and varied speed options, then a more traditional style will be more comfortable and familiar. Plus, we have yet to see any curved treadmills to match the value provided on these brands. They have great interactive features like music, personal coaches, fitness tracking, and virtual runs that help bring interest to an otherwise uneventful workout.